Deep Nutrition: Why Your Genes Need Traditional Food is written by Dr. Catharine Shanahan, who studied molecular biology at Cornell University and then attended Robert Wood Johnson Medical School. This book discusses the subject of Nutrigenomics, which explores how nutrients and other substances influence gene expression. By choosing foods that are in harmony with the heritage of your ancestors, you will be able to improve your health and take control of your destiny. The author studied the diets of many traditional cultures around the world, including Ancient Egyptians, Maasai, Japanese and French, and discovered factors common to all of them, which she calls the “Four Pillars of World Cuisine”. The four pillars include fermented and sprouted foods, raw foods, meat on the bone and organ meats. Shanahan claims that these four classes of foods are the nutritional foundation of our species. To get started on the nutrigenomic diet you simply begin to eat some of these foods in your diet. Commence by eating something fresh once every day, such as a large salad, and then start to experiment with some of the other recommended foods. You will be avoiding modern processed foods because they are associated with the decline in health that is prevalent in Western cultures. All junk foods are strictly off-limits as are any foods containing vegetable oil, high-fructose corn syrup and sugar. Rather than adhering to a restrictive meal plan with limited options, you will learn to distinguish traditional foods from the modern substitutes. This way you will be able to select the best foods and choose recipes that fit within the principles of the program. Eggs, cream, butter, yogurt, raw milk, sardines, salmon, fish eggs, smoked oysters, liver, beef heart, chicken, oats, brown rice, quinoa, sprouted grain bread, peanut butter, avocado, tahini, coconut butter, chickpeas, sauerkraut, fruit, vegetables, kombucha, tomato juice, dark chocolate, tea, wine. If you are new to exercise you should start with ten minutes a day and increase by ten percent each week. High-intensity interval training is recommended because it produces the fastest results in relation to weight loss and increased metabolism. 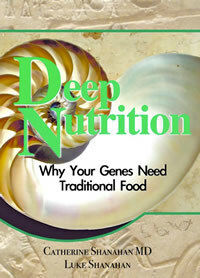 Deep Nutrition: Why Your Genes Need Traditional Food retails at $19.99. Click here to order this nutrigenomic diet at discounted price. Encourages the intake of a wide variety of traditional unprocessed foods. Provides information on how you can use diet to improve your gene expression. Encourages the use of fermented foods, which have been shown to improve digestive health and immune function. Includes meal suggestions and some recipes. Contains unique advice on eating during pregnancy. Nutrigenomics Dispels some of the myths about cholesterol. Some of the recommended foods, such as organ meats and sauerkraut, may not appeal to all dieters. Advocates a high consumption of saturated fats, which is contrary to currently accepted recommendations for prevention of heart disease and diabetes. May require a larger time investment for the preparation of meals. Nutrigenomics isn’t specifically focused on weight loss. Does not contain a large recipe selection. Deep Nutrition is an eating program based on the nutrigenomic diet with the intention to give readers the tools to enhance gene expression and promote optimal wellbeing. This book combines the principles of the Paleo diet with traditional cuisine, utilizing modern scientific research to explain why this approach is beneficial for improving our health.